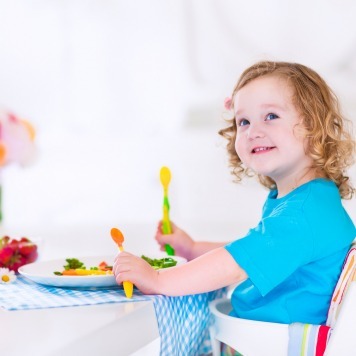 Including your children in the meal preparation process increases their interest and appetite for healthy eating. When parents convey interest and enthusiasm for cooking nutritious meals, they are more likely to instill the same attitudes in their children. The next time you may doubt the importance of family meals, consider how shopping, cooking, and eating together will strengthen your family’s healthy habits. Start by keeping these few things in mind. Teaching your children how to cook is a lasting life skill that will enable them to make their own healthy choices as they grow up. Cooking will empower your children to independently develop their food preferences and understanding of nutrition to implement into their own healthy lifestyles. Shared meals create an additional avenue of communication for families. It can be a place to discuss the day’s events, enjoy each other’s company, and provide an open forum for family discussions. Asking open-ended questions such as “How was your day? Tell me about it…” rather than “Did you have a good day?” will help stimulate more conversation topics and provide better understanding between family members. Rather than eating in front of a television or computer screen, family meals will create mindful eating habits where kids can learn to listen to their bodies. When we eat slowly and without distractions, we are more aware of our hunger levels and are less likely to overeat. A planned daily, weekly, or even monthly meal can improve a family’s functionality as well as its trust between family members. When parents set aside special time for meals with their family, this further instills a sense of self worth within their children. It is important for parents to honor the allotted times planned for family meals so that their children know they can count on their parents to remain reliable. In general, meals are often much healthier when they are prepared at home. It is difficult to know what fast food restaurants and other food service providers put into the foods they serve. When meals are prepared at home, it is often less processed and more nutritious. What is a skill we can teach our kids that will empower them to make healthy choices as adults? Answer: How to cook. What is a benefit of mindful eating? Answer: We are less likely to overeat.